Take it where you go! 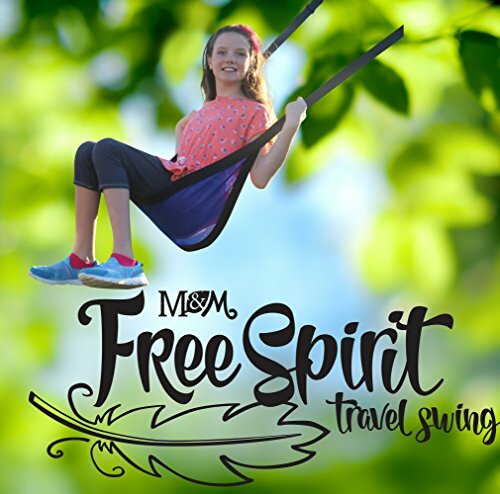 a strong, lightweight, portable swing with made-for travel in-mind design and two quick options for setup, this swing is a must-have for all of your adventures. A bold sky Blue color with daisy-chain loops on hanging straps for simple hanging-length adjustments. Take along to the baseball park, camping, or your best friends favorite back yard tree. If there's a place to hang it, you should take it! your camp chair has a new travel buddy. Rated to hold 250 lbs. Ages 3+. Two quick and simple install methods: clip with included steel spring clips to existing hardware, or loop the nylon straps over the over a tree branch and clip on strap loops. 1.5" wide nylon straps with Daisy chain loops on top for easy hanging. Just clip or loop! Lightweight, portable and compact. Travel cinch-closure storage bag included. Safety rated to 250 lbs. Rated for ages 3+. Also available in deep stargazer purple. View More In Play Set Attachments. If you have any questions about this product by M & M Sales Enterprises, contact us by completing and submitting the form below. If you are looking for a specif part number, please include it with your message.